I’ll have the Mexican Wine! Non, Non, Non … Hombre! The Mexicans will not be left behind in this global wine trend! This article was very fascinating, I must get my hands on a bottle! Also very cool to read that the oldest continually operating winery in the America’s is in Mexico! Pour yourself a glass, turn on some mariachi or some Chente Hernandez…..and lets get to readin’! Andale Andale! Arriba-riba! One of the earliest casualties of the drug-related violence in northern Baja California has been its wine valleys, particularly the Guadalupe Valley, northeast of Ensenada, which has single-handedly put the country on the wine connoisseur’s map and earned the moniker, “Mexico’s Napa Valley.” Monte Xanic, Santo Tomas and L.A. Cetto are among its best-known brands. Mind you, we have heard from legions of oenophiles who have made tasting trips in the past year without encountering any of the types of problems currently grabbing headlines, but with Baja Norte officially outside the comfort zone, this might be just the time to sample Mexico’s undiscovered wine regions. Though it produces 90 percent of Mexico’s wines today, Baja is a relative newcomer to the industry. The oldest winery — not just in Mexico but in all the Americas — is in Coahuila state. Spanish conqueror Hernán Cortés, so the story goes, rather quickly depleted his wine stock in celebrating the conquest of the Aztecs in the early 1500s. One of his first acts as governor was to order thousands of grapevines planted throughout New Spain; the first vineyards took root in Puebla, Querétaro, Aguascalientes and Coahuila states. All ships bound for the colonies carried grapevines, and eventually wine exports from Spain to the New World plummeted. In 1699, King Philip II abruptly reversed course, banning New World wine production except in service to the church. Jesuit priest Juan Ugarte planted the first vines in Baja California when he came to the Loreto mission in 1701. Significant quantities of grapes grow in seven states, generally divided into three broad areas: North (Baja California and Sonora); La Laguna (Coahuila and Durango); and Center (Zacatecas, Aguascalientes and Querétaro). Compared to the products of cooler climates, Mexico’s wines tend to be spicy, full-bodied and ripe. Some purists recommend staying with reds, though improved techniques have produced respectable whites as well. Northern Baja’s humid winters, dry warm summers and sea breezes produces most varietals found north of the border. Laguna: The most important mainland wine region straddles Coahuila and Durango states in the northeast. Grapes thrive in the mile-high Parras Valley (parras means “grapevines”) in Coahuila, about 5 miles north of Parras, one of Mexico’s Magic Pueblos. Here, warm days, cool nights and low humidity keep wine-loving bugs and fungus at bay and mountain springs create an oasis in the arid highlands. This is primarily red wine country, inspired by Bordeaux: cabernet sauvignon, Shiraz, merlot and Tempranillo. Careful handling also yields delicate whites such as chenin blanc, chardonnay and Semillon. The Parras Valley’s most important winery — regularly included alongside Baja’s finest on connoisseur’s lists — is Casa Madero, the oldest continually operating winery in the New World. Founded in 1597 as Hacienda San Lorenzo, Casa Madero produces a broad range of varietals, including award-winning chardonnay, chenin blanc and Syrah. Its brandies are considered among the best in Mexico. Casa Madero offers daily tastings and tours; its wine museum is open 9 a.m.-5 p.m. The palatial, 24-bedroom hacienda does not operate as a hotel but is available for rent to groups that occupy at least 10 rooms. Another developing winery in northern Coahuila is Bodegas Ferrino, founded by a 19th century Italian immigrant, near the town of Cuatro Ciénegas. Querétaro: One of Mexico’s most prosperous wine growing areas, Querétaro’s vineyards occupy altitudes around 6,500 feet. Sparkling wines make up the bulk of its output, but sauvignon blanc, St. Emilion, cabernet sauvignon and pinot noir are also produced here. 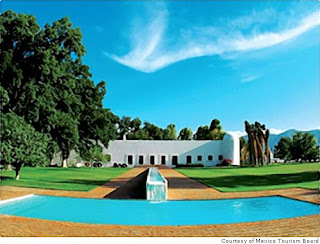 This is the home of the Spanish vintner Freixenet’s Mexican operation. Freixenet is best-known for its dry sparkling wines (vinos espumosos, or “frothy wines”) in satiny black bottles, produced by the champenoise method of fermentation discovered by Dom Perignon in the 17th century. The winery also produces still wines, mostly red blends. Cavas Freixenet de Mexico, north of Tequisquiapan, offers guided tours, classes, concerts and festivals throughout the year. The other major wine estate is Compania Vinicola Los Eucaliptos in Ezequiel Montes. Vinos Hidalgo La Madrilena is a local operation with wineries in the San Juan del Río region. Zacatecas: Lying south of the “global wine zone” (between latitudes of 30 and 50 degrees), Zacatecas’ vineyards grow in the Ojo Caliente and Valle de la Macarena regions. At altitudes of about 6,500 feet, crisp winters and fresh summer temperatures, combined with moisture-retentive clay soils, are optimal for sugar-rich grapes that mature quickly. A range of European red varieties (cabernet sauvignon, merlot) grow here, as well as those more common to California, such as zinfandel, and American hybrids (Black Spanish, Lenoir). Some white grapes also thrive here. Zacatecas, one of Mexico’s beautiful silver cities, stands on its own as a historic destination, but it also boasts several small wineries. The best-known local brand is Casa Cachola. The winery is outside the city in Valle de las Arisnas at the intersection of highways 45 and 49. If you plan to visit, make arrangements in advance. The VinoClub SMA is maintained by a former wine collector, sommelier and wine consultant who lives in San Miguel de Allende and writes a wine column for the local newspaper. The site includes news, tasting notes and details on the most notable wineries. Mexican Wines, headquartered in Mexico City, is harder to navigate, but it has a wealth of information for those willing to drill down into the site, including restaurants and wine clubs (mostly around Mexico City and Baja Norte). It includes links to internet sales of some of Mexico’s most prominent wines and a frequently updated blog with wine news from many sources. Casa Madero winery, the oldest winery not just in Mexico but in all the Americas. Well what’ya know!!! Looks like a little wine country traveling in the “Mexican Napa Valley” is in order! If you try one of these Mexican wines….or another….let me know how they are! May your glass always be filled with devine wine! Previous Previous post: ‘Bout Damn Time! Next Next post: A rose by any other name….